Sepsis is a potentially fatal condition in which there is whole-body, systemic inflammatory response (see inflammation) to a microbial (often bacterial) infection. Effectively, the immune system massively overreacts to the infection, overwhelming the normal, healthy processes of infection control that take place in the blood. This overreaction can lead to what is called a "sepsis cascade," as explained below. Infants, the elderly, and those with weakened immune systems are most at risk from sepsis, but even healthy people can quickly become dangerously ill from it. Rapid diagnosis and treatment with broad-spectrum antibiotics is essential, because one third of people who get sepsis die from it. 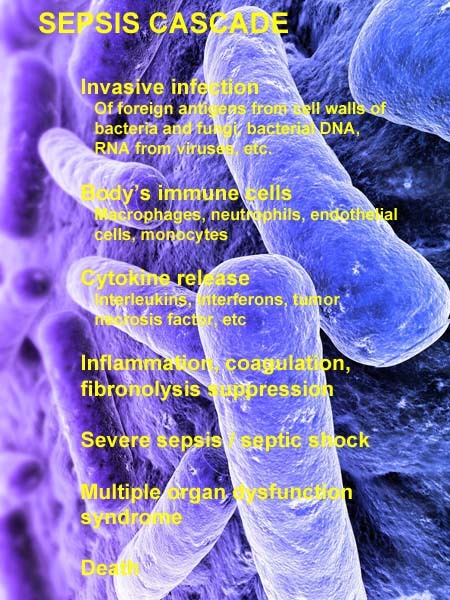 A number of terms are related to sepsis. Septicemia is a medical term once common but now generally avoided because it was used inconsistently, even by medical professionals, to mean on the one hand, sepsis itself, and on the other, conditions such as bacteremia which correctly refer just to the presence of microbes in the blood. The common name "blood-poisoning" is antiquated, vague, and should be avoided. Sepsis falls into a category of states known as systemic inflammatory response syndrome or SIRS. However, other conditions may be associated with SIRS that are not associated with the presence of infection; these include pancreatitis, burns, and multiple traumatic injury. Severe sepsis can lead to septic shock (life-threateningly low blood pressure) and multiple organ failure (multiple organ dysfunction syndrome). An inflammatory response to the presence of microorganisms or the invasion of normally sterile host tissue by those organisms. Heart rate higher than 90 beats/min. A documented infection with at least two of the four systemic inflammatory response criteria. Sepsis is, by definition, caused by infection. Sepsis associated with dysfunction of one or more organ systems, hypoperfusion, or hypotension. Hypoperfusion and perfusion abnormalities can include lactic acidosis, and oliguria (scant urination). Sepsis with hypotension (systolic blood pressure less than 90 Hg or a reduction of 40 mm Hg from baseline) despite adequate fluid resuscitation along with the presence of perfusion abnormalities that may include lactic acidosis, oliguria, or an acute alteration in mental status. Patients who are receiving inotropic or vasopressor agents may not be hypotensive at the time that perfusion abnormalities are measured. The presence of altered organ function due to altered perfusion in an acutely ill patient such that homeostasis cannot be maintained without intervention. When the body is invaded by microbes, such as bacteria, the immune system swiftly mounts a protective inflammatory response. However, when this response is excessive, far surpassing the counterbalancing effect of anti-inflammatory regulation, the result can be catastrophic, often leading to multiple organ failure and death. The immune system guards against infection by recognizing antigens, each of which is unique to a particular microbe. Antigens may include proteins from the cell walls of bacteria and yeast, bacterial DNA, and viral RNA. Receptors on the body's T-cells can recognize antigens and bind to them. This binding leads to the activation of macrophages and neutrophils (types of white blood cells) and the release of special proteins called cytokines (interleukins, interferons, and tumor necrosis factor) that initiate the inflammatory response. This leads to microvascular permeability (leaky capillary walls) and vasodilation. Damage to blood vessel linings from inflammation triggers a coagulation cascade that causes blood (fibrin) clots to form and localize the infection. In a healthy situation, the formation of blood clots is controlled by a process called fibrinolysis, or the breakdown of fibrin clots. But during sepsis, fibrinolysis is suppressed, and blood flow to vital organs and extremities becomes blocked with microscopic blood clots. If the inflammatory process to run out of control, severe sepsis can occur, leading to decreased blood flow to vital organs and, eventually, death. When the body counteracts and tries to control the inflammatory response by producing anti-inflammatory cytokines, a period of immunosuppression occurs that, if prolonged, can increase the patient's susceptibility to other infections. The series of steps beginning with an overreaction of the immune system to invading microbes is referred to as sepsis cascade and is summarized in the illustration (above right). Any circumstance that makes it more likely for bacteria enter their bloodstream also elevates the risk of sepsis. Such circumstances include the use of medical devices, such as catheters, drainage tubes, or breathing tubes, that provide an artificial passageway for microbes to invade the body. The longer the device is left in place, the greater the risk. Injecting recreational drugs: The drugs and needles used are rarely sterile. Each injection may cause bacteremia to varying degrees. People who use these drugs are also at risk of disorders that can weaken the immune system (such as AIDS). Having a prosthetic joint or heart valve or certain heart valve abnormalities: Bacteria tend to lodge and collect on these structures. The bacteria may continuously or periodically be released into the bloodstream. Being treated with antibiotics for other infections: Some bacteria that cause infections and sepsis are resistant to antibiotics. An infection that persists in people who are taking antibiotics is more likely to be caused bacteria that are resistant to antibiotics and that can cause sepsis. Most people with sepsis have a fever, though some have a body temperature below normal. Shivering and feeling weak are other early symptoms. Breathing, heart rate, or both may be rapid. If sepsis worsens, the patient may become confused and less alert. The skin becomes warm and flushed, the pulse rapid and pounding, and the breathing rapid. Urination reduces in amount and frequency, and blood pressure decreases. Later, body temperature often falls below normal, and breathing becomes difficult. The skin may become cool and mottled or blue because blood flow is reduced. Reduced blood flow may cause tissue, including tissue in vital organs (such as the intestine), to die, resulting in gangrene. If septic shock develops, blood pressure remains low despite treatment. Early suspicion of sepsis comes if a person with an infection suddenly develops a markedly high or low temperature, rapid heart rate or breathing, or low blood pressure. Confirmation of the diagnosis involves taking a blood sample which in the laboratory is examined for the presence of bacteria (bacteremia), another infection that might cause sepsis, or an abnormal number of white blood cells. Results of such tests are usually available in one to three days. However, in the case of an individual who as has been taking antibiotics for their initial infection, bacteria may be present but not grow in the lab culture. Sometimes catheters are removed from the body, and the tips removed and sent for culture. Finding bacteria in a catheter that had contact with the blood indicates that bacteria are probably in the bloodstream. To check for other infections that may cause sepsis, samples are taken of fluids or tissue, such as urine, cerebrospinal fluid, tissue from wounds, or sputum coughed up from the lungs. These are cultured and checked for bacteria. Imaging tests may also be done. Blood tests to measure levels of lactic acid, other metabolic waste products, and platelets (cells that help the blood clot). Levels of waste products may be high, and the level of platelets may be low. Blood tests or a sensor placed on a finger (pulse oximetry) to measure oxygen levels and thus evaluate how well the lungs and blood vessels are functioning. Electrocardiography (ECG) to look for abnormalities in heart rhythm and thus determine whether the blood supply to the heart is adequate. Other tests to determine whether shock results from sepsis or another problem. Sepsis and septic shock must be treated immediately with antibiotics, even before test results confirm the diagnosis. A delay in antibiotic treatment greatly decreases the chances of survival. People with symptoms of septic shock are immediately admitted to an intensive care unit for treatment. When choosing the initial antibiotics, consideration is given to which bacteria are most likely to be present, which depends on where the infection started. Often, two or three antibiotics are given together to increase the chances of killing the bacteria, particularly when the source of the bacteria is unknown. Later, when the test results are available, doctors can substitute the antibiotic that is most effective against the specific bacteria causing the infection. If present, abscesses are drained, and catheters or other medical devices that may have started the infection are removed. Surgery may be done to remove dead tissue. Severe sepsis or septic shock can be treated with drotrecogin alfa (activated protein C). This drug is an artificially produced human protein that prevents inflammation and blood clotting. It may reduce the risk of death due to severe sepsis or septic shock. People with septic shock are also given large amounts of fluid intravenously to increase the amount of fluid in the bloodstream and thus increase blood pressure. Drugs, such as dopamine or norepinephrine (which cause blood vessels to narrow), may be needed to increase blood flow to the brain, heart, and other organs. Oxygen is given through a mask, through nasal prongs, or, if a breathing tube has been inserted, through that tube. If needed, a mechanical ventilator is used to help with breathing.